Rancho Gold & Jewelry is home to the most knowledgeable, and experienced diamond buyers in Las Vegas. We understand the importance of providing each client with an informative and comfortable experience. No matter the size, cut, color, or condition of your diamonds, our focus is to educate you on their true value. Should you decide to sell, we will offer you immediate cash for your diamonds. Feel free to call us at 702-626-0000, or come visit us today! With our years of experience as diamond buyers in Las Vegas, we have found that educating our clients about the factors affecting diamond evaluation is an experience that most appreciate. If you’re wondering where to sell diamonds in Las Vegas, you will be confident in our comfortable, no pressure, and honesty. A diamond’s shape and cut contributes to its brilliance and visual appeal. Its “cut grade” is an objective measure of the quality of a diamond’s proportions and faceting, as well as how well it captures light and reflects it back through the top of the diamond. A diamond with poor proportions and symmetry will not reflect light very well, and will have a lower cut grade. A diamond with a high cut grade will have more fire and sparkle. It is also more desirable and, therefore, has greater valuable. After our experts evaluate the cut, you could walk away with cash for your diamonds! Most diamonds contain impurities that add different degrees of coloration. A diamond’s color is usually graded on a scale of D-Z, with D being completely colorless. Generally speaking, our expert Las Vegas diamond buyers will deem a colorless diamond more valuable than one with coloration. However, some diamonds have natural fancy and sometimes intense colors, such as canary yellow, blue, red and orange. If a diamond is certified as "Fancy" colored it can have more value. For a colored diamond to be desirable, it should be determined to be a fancy, natural coloring, and not artificially added by using radiation. Clarity refers to the observable inclusions, blemishes or other “flaws” within the diamond. The fewer flaws a diamond contains, the greater its clarity. There is a total of 11 GIA grades (FL, IF, VVS1, VVS2, VS1, VS2, SI1, SI2, I1, I2 and I3). Assessing a diamond’s clarity helps determine its value. 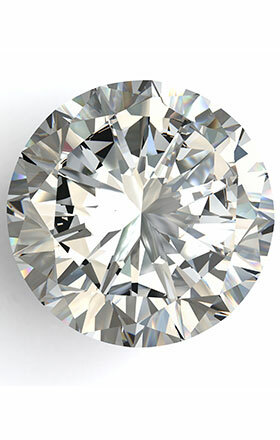 FL diamonds are “flawless” and free of any imperfections. These are extremely rare and valuable. All other grades indicate an increasing number of flaws that impair a diamond’s value. Rancho Gold & Jewelry's diamond buyers will make an offer on most diamonds, regardless of grading. A carat is a unit of diamond weight (1/5 of a gram). Larger diamonds are heavier, rarer, and generally more valuable. However, carat weight is only one of the four factor that determine a diamond’s value and its fair market price. For example, a 2.0 carat diamond with a high degree of unwanted color and many flaws will be far less valuable than a colorless, flawless 1.0 carat diamond. Rancho Gold & Jewelry is the premier place to sell your diamonds in Las Vegas. Many better quality diamonds are originally purchased with a “Lab Report Certificate”. The best-known certificates are GIA, AGS, and EGL. A diamond certificate has the technical specifications of the diamond and is an important tool in evaluating the value, and ultimately, the price we offer when buying diamonds. While a certificate generally adds value, it is not required to sell diamonds in Las Vegas at Rancho Gold & Jewelry.